I was giddy with excitement as I drove across the bridge and towards the jungle of greenery that is the QUT Gardens Point campus. 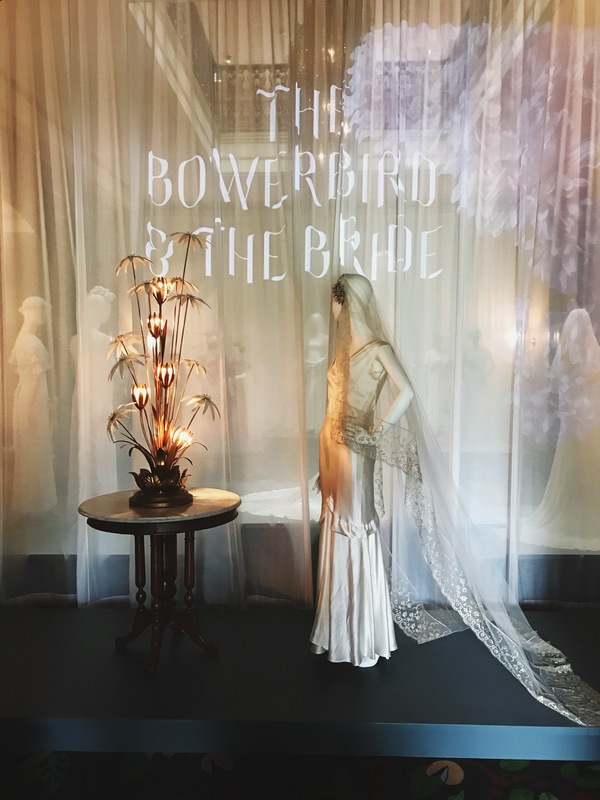 I had been lucky enough to be invited to an intimate and exclusive preview of The Bowerbird and the Bride, an exhibition curated by award winning Australian costume designer Marion Boyce (Miss Fisher Murder Mysteries and The Dressmaker). 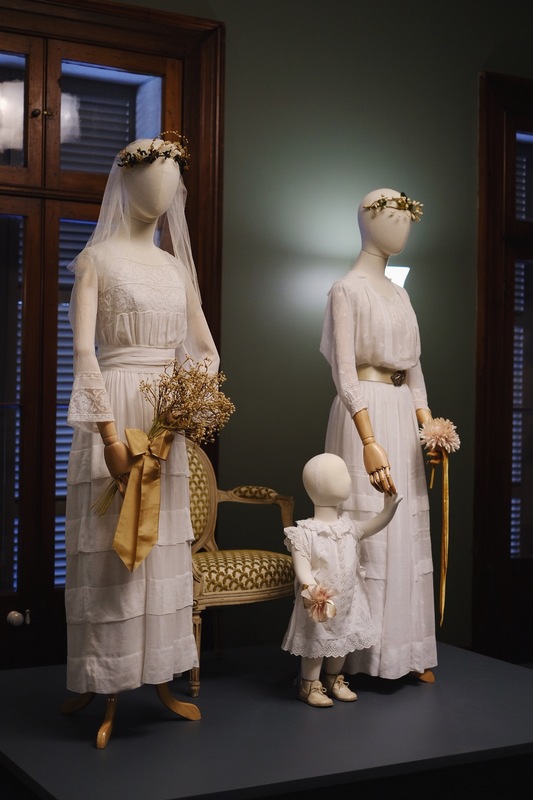 The event and exhibition took place in the heritage listed Old Government House, and as I walked in I had an instant flash back of school excursions visiting historical sites such as this. I’d always loved learning about history, and since this exhibit was the perfect mix of history AND fashion, I knew I was in for a treat. The morning began with a small gathering of people who looked like they had read many, many more books than me. This room was filled with respectable, fashionable and intellectual folk, and I couldn’t help but feel a little out of place. Since I didn’t know anyone, I stuck to the wall with a cup of honey and camomile tea, trying not to get caught eating the delicious tea cakes they had laid out. Luckily, a young woman around my age walked through the door and I instantly felt like I could talk to her. Her name was Chloe, a writer and aspiring curator who had played a huge part working on this exhibition – the perfect new friend! She was friendly, smart and very sweet to introduce me to Marion Boyce herself (I had a minor fan girl moment but mostly kept my cool). Soon, we were ushered down to the main exhibition for the fun to begin. The first scene upon entering sets an opulent, beautiful and undeniably vintage tone. 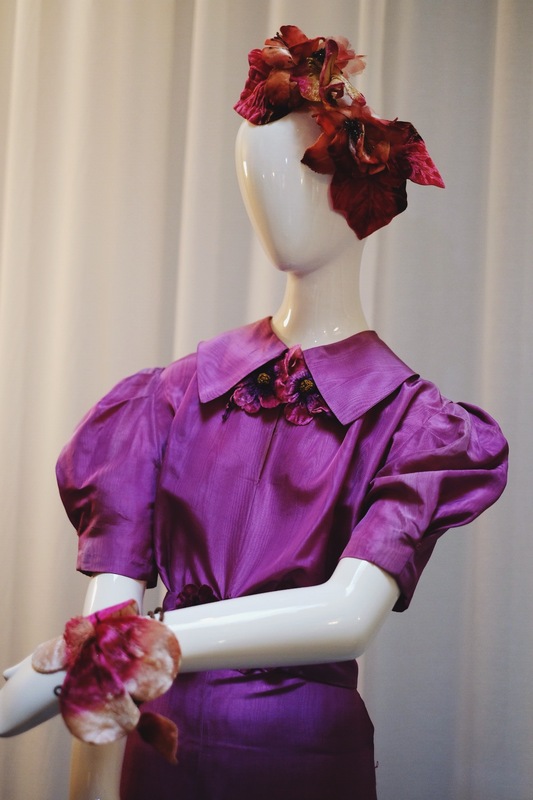 A pearly mannequin adorned in a silky cowl neck gown and grande lace trimmed vail greets you. Fashion lovers and soon-to-be-brides better get your cameras ready, for you are about to embark on a wonderful adventure through time. 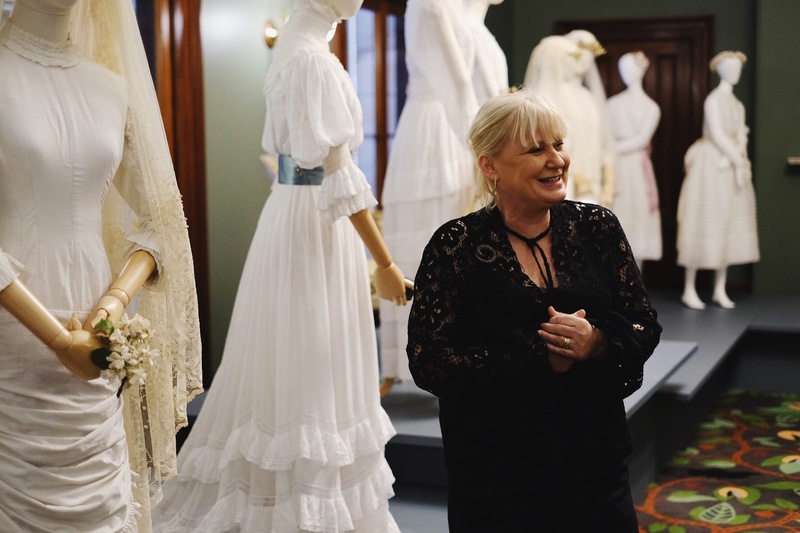 We followed Marion from room to room, as she shared personal stories about acquiring different garments and the mission of restoring many of them herself. 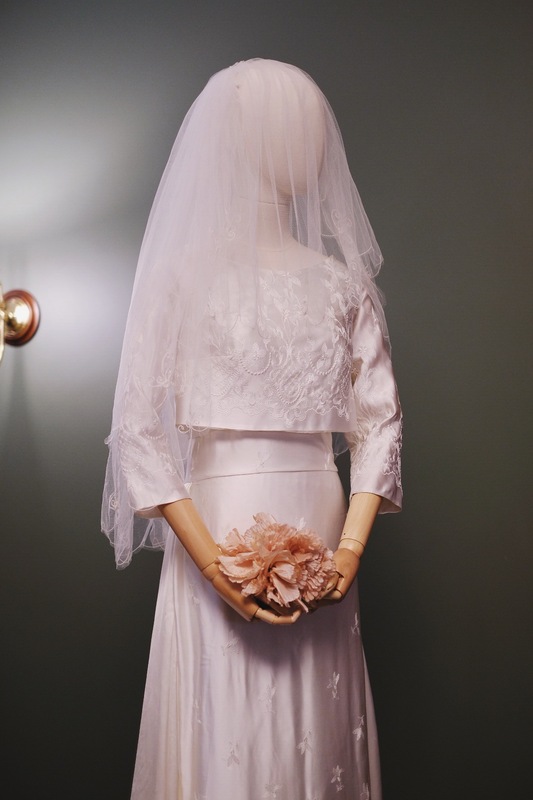 Together, we travelled from the 1860’s to the 1970’s, observing the details of more than 40 bridal gowns, each with a story of it’s own. A notable favourite of mine was a thrifty pair of gowns that had been fashioned out of curtains (the only available fabric at the time). 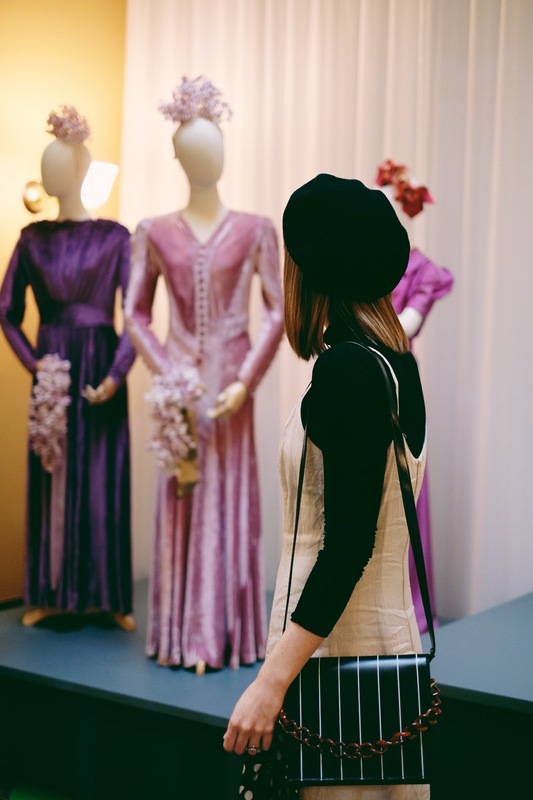 I also adored a bright velvety lilac dress that the bride had first worn as a wedding dress, but then kept as her dancing dress – the ultimate outfit repeater, my kind of gal! Make sure to check out the room filled with antique accessories and treasures, plus there is a delightful row of knickers and underfrillies hanging off clothes lines on the way that is bound to make you smile. I don’t want to give too much away, because this really is a show that needs to be experienced in person, where the full effects of the thoughtful styling, soft lighting and spinning mannequins on poufs and tables can take hold. Take your best friend, your Mum, your Gran, this is enjoyable for everyone, from the fashionista to the historian. It’s running from the 12th of July to the 19th August, 2018 and you can grab your tickets HERE. It’s better than a good cup of tea!